If you don't have wifi on when you recharge you ipad, you will never get an update automatically downloaded. I'll update, the betas seem snappier here. Running iOS 12 on my iPhone 7 Plus. Everything is quicker and smooth. I won’t install it on my iPad yet because I need all of my music apps to work. I doubt much has to change to the apps but I’m just being cautious. Running the GM of iOS on all my devices now, no issues at all. Feels even better than the betas did, and all my apps work fine. Nice little update actually, my iPhone X feels like new again. I don't know, my air 1 has been terrible under ios11, way way slower than 10 and have to kill off apps in the background constantly. I even had completely reset iPad and reinstalled apps to a clean os, rather than using a backup. If ios 12 really does what it says and increases the usability of my air 1 I will be very happy. I’ll be throwing caution to the wind and upgrade my iPhone to IOS12 just so I can use Google Maps or Waze in my car equipped with Apple Car Play. I’ve never been a big fan of Apple Maps. I may stay with 11.4 for a while on my iPad Pro just in case. Or not! Oh really? Damn, that's crazy! A drum sequence and a heavy synth (Zeeon) in BM3 with 2-3 aux chan and other fx AUs are enough to have much fun. AUM/AB3 with 2-3 synths w/ MV08 and FXs do the same. It's not horrible, but it's not great. But CRACKLE-CITY is always right around the corner. It could be the simple turn of a knob and it's suddenly it's the sounds of Megratron's painfully loud indigestion. If you are willing to take one for the team next week, feel free to update the Air1 and report back. I'm sure many here, including myself, will appreciate it. The reports from the beta were that 12 works great on the Air 1 and Mini 2 so I'm looking forward to finally having an upgrade path. Technically there's a way to get it now if you sign up for the open beta, then unregister when the public release comes, or something like that. 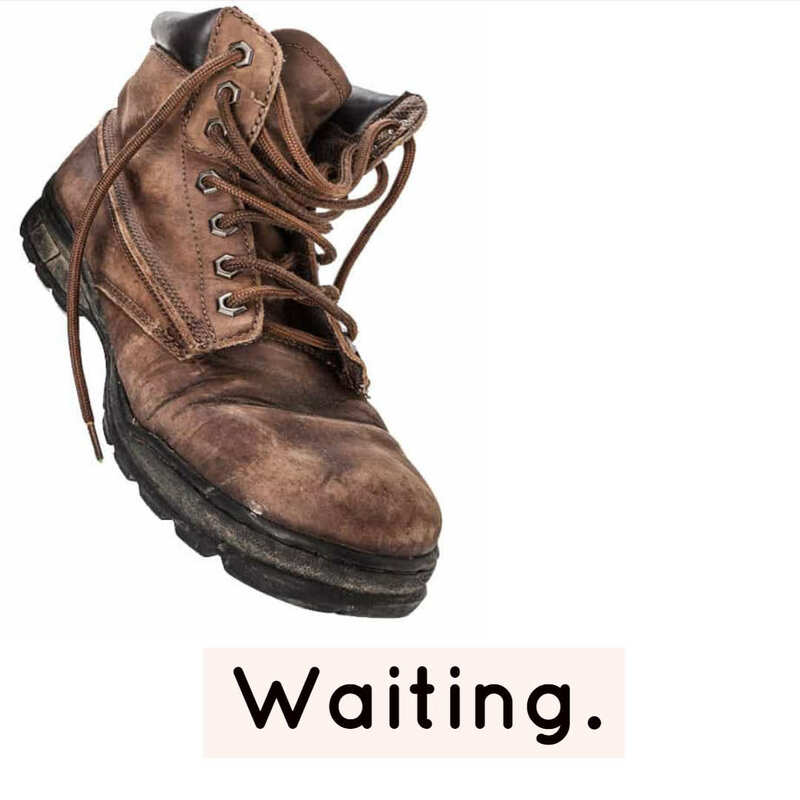 I didn't look into it too closely, but it's something to pursue if anyone's really impatient. I hope it will be about the same time in Norway. I’m not going full iOS12, but I will install it on my newest 12,9. Last update on the 2017 model gave it a bootup time of over 4 minutes, versus 20 seconds before the update. I’m hoping it’s blowing up this time, just to get a new one. So I’m going half iOS12, to begin with. 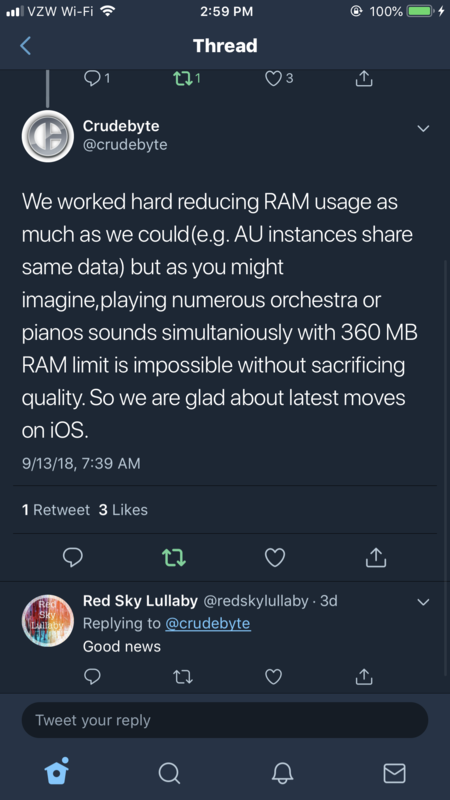 I’d love to hear that they bumped up the memory limit for AU instancing on devices with enough ram. Can’t wait to run GMaps in my car. Way better. My experience hasnt been good. Lots of freezing and slowness on Cubasis. I dont think its Cubasis itself though i think its is one or a few of my FX. My guess, one of the Fred Corvest or Audio Damage ones that doesnt seem to jive too well. Cubasis runs perfectly fine here, i would need more info to test specifics though, I'm not a heavy Cubasis user. @YZJustDatGuy was really hoping for this! Wow, that sounds like great news. @McDtracy have you seen this? Thanks @YZJustDatGuy , where did you find this thread, please? Found it from the iPad Musician group on Facebook but went to Twitter grab screenshots. 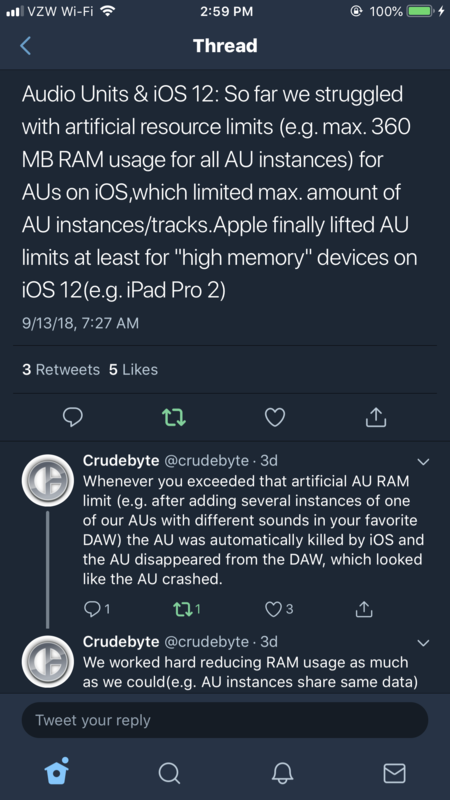 So 4gigs of ram or more required for the AU limit getting lifted? I wonder if they at least increased the limit for 2gig devices. Thanks, @YZJustDatGuy . What do you think of that group, if I may politely ask? I hate Facebook ( just me) but might make an exception for something like that if it embellishes this forum. Is iOS 12 already available? Not in UK yet still early over in Appleland 8am !